Good morning Ladies and Gentlemen, welcome to Max and Collin’s formidably flamboyant and delinquently day-dreamy parlour located within the splendidly scenic city of Lancaster! True, some have called it a barren affair; its charms a figment of fiendish imagination, but we consider that such people spend too much time indulging in unsavoury gossip. You find us this morning reminiscing about the innocent delights of youth… at least I think that is what we are doing.. we are coming out of the end of an all night tiffin session with the lovely Miss Ottis, our local Milliner. I’m not sure Max has noticed that she gave her leave over an hour ago and he has just finished regaling her empty chair with a charming story about how the poet Christina Biscotti first introduced him to something called a sherbet rocket. I confess I couldn’t follow most of it (sweet delights like that may be illegal in the land f Ire but below the sea they are simply unobtainable, as even the most intrepid cake smuggler does not think to put on a diving suit and peddle their wares along the sea bed.) but the whole thing seemed to take place on a punt in Oxford and ended in a near death collision with a steamer. 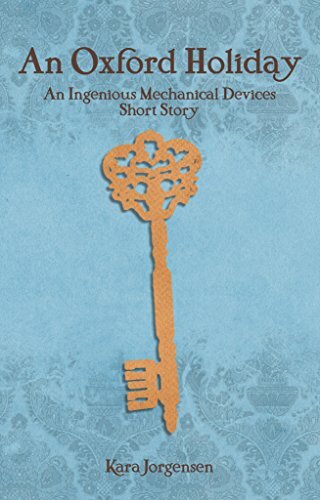 Our book this morning is An Oxford Holiday, another beautiful offering from the mistress of ingenious mechanical devices, Kara Jorgensen. An oxford holiday is a short companion story to the series and falls between books two and three. Lovers Adam and Immanuel have been separated since their last adventure, Adam lives in London while Immanuel is finishing his studies in Oxford. Although the nightmare reality of Immanuel’s capture and torture by the gentleman devil is now over, the Oxford bully boys continue to make his life a misery and his experiences have left scars that are both physical and emotional. He is overjoyed at the prospect of Adam coming to stay for a weekend, even if they cant let their feelings show in public it will be good to have a friend as company, and then f course Adam will have his own hotel room… But things don’t go as planned as an emergency at the university means that Adam and Immanuel may not get the break they planned for after all.